Neither our highest hopes nor our greatest fears have been realized. Batman v. Superman: Dawn of Justice is not an unqualified triumph that combines The Dark Knight with The Avengers. But it's also not an unqualified disaster that disgraces both characters. Instead, it's an extremely flawed, overlong and sometimes muddled blockbuster that also manages to be, in it's best moments, thrilling enough for fans. For starters, whether or not you enjoy Batman v. Superman may largely depend on whether you enjoyed Man of Steel. If you completely disliked that film but were hoping for this one to make up for it, you're very unlikely to find satisfaction here. 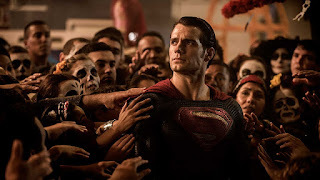 Director Zack Snyder has crafted a follow up which shares most of that film's distinctive strengths and weaknesses, including its serious tone and uneven plotting, and its tweaks to the legend of Superman (which are either intriguing or blasphemous, depending on who you talk to), and its mix of somber bleakness with hopeful optimism. The film begins with a flashback to Man of Steel's climactic sequence, which plays even more like a comic book 9/11 here. While this is deliberate and important to the subtext of the film, it's so dead on that the sequence is uncomfortable to watch. 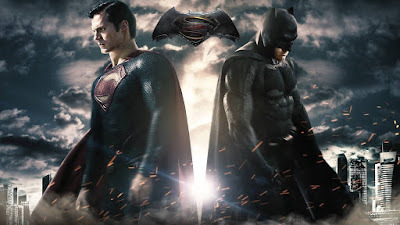 The biggest tonal difference between Batman v. Superman and Man of Steel is that the former felt too quick to turn everything into an action sequence (which seemed to us to be overcompensating for complaints of too little action in Superman Returns), and this time Snyder seems too reluctant for much of the film to let anything develop into a fully formed action set piece. We keep feeling like we're getting set ups that almost lead to one, but then it finishes too quickly or most of the action takes place off screen. In fact the first two thirds of the film are frequently hampered by the feeling that each scene is taking too long to build to where it's going, then too quickly cuts to something else the moment it really starts to get interesting. Snyder is a fascinating director in that his films tend to succeed more on style than substance, yet not for a lack of what appears to be genuine ambition to create gripping drama that doesn't always gel. However, when the third act action takes over, Snyder is in his element, and that's when the film delivers its biggest thrills, which above all else are about the excitement of seeing these ultimate icons of superhero legend finally share the big screen. Ben Affleck makes a satisfactory Batman/Bruce Wayne, despite all of the overblown controversy over his casting. His character isn't nearly as nuanced as Christian Bale's take in the Nolan films, but that's largely due to the demands of a crowded story that tries to give equal character arcs to both leads (unfortunately not fully succeeding for either one). His Batman is also much more disturbed and hard edged than those we've seen before. 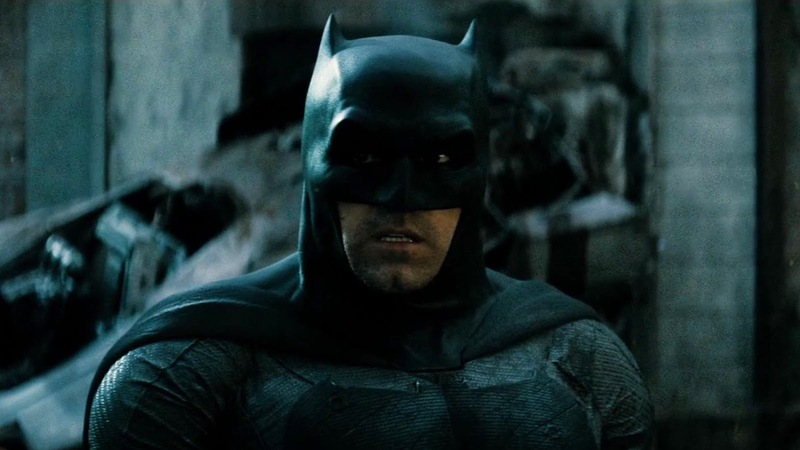 While Bale was a heroic Batman to relate and aspire to, Affleck's is, for most of the film, a look at a damaged caped crusader who has moved from his crusade on to a darker and more destructive path. It can be jarring and somewhat bothersome to those of us with a deep emotional connection to the more heroic vision of Batman, but it's a legitimate take on the character born from the grim, dark comics of Frank Miller. And Affleck has greatly improved as a leading man presence over the years, adding a maturity and confidence to his screen presence that was mostly absent from his early work. He may still be best as a writer/director, but he has become the leading man he was always supposed to be, and it will be interesting to see what he gives us in planned future installments. 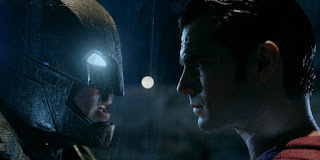 Here, Affleck does his best with a characterization largely based on assumption: it assumes you know all about who Batman is (although it does take plenty of time to bombard us with yet another portrayal of his parents' death, because heaven knows we can never see that too many times) and it even assumes you know the major arcs of the comic books (a defining moment for the character, and one of our favorites, is based entirely on the idea that you have at least a passing familiarity with the acclaimed comic A Death In The Family.). Snyder's take on the Bat isn't up there with Nolan's, or with Tim Burton's 1989 version. It's about on the level of Val Kilmer's turn in Batman Forever, but it's not the disaster of Batman & Robin, and if we're being honest with ourselves, it's no really more problematic than Tim Burton's wildly uneven Batman Returns. As for the boy in blue, Henry Cavill has been given an unfair characterization by many who rushed to categorize him as wooden and uninteresting, but he really does nail the character, immersing himself in the role and making a strong and engaging Superman, and the film is often at its best when it is acting as direct continuation of his story. In particular, the interaction between Superman/Clark and Amy Adam's Lois Lane is a real highlight. Adams is a first-class actress who makes any film she's in better, and even with a sometime underwritten role she makes a large contribution here. However, while Superman is given a moral dilemma with which to wrestle (is he helping the people of Earth or hurting them? ), like Batman he suffers from the overcrowding of the film and isn't given the emotional development the character needs. Arguably the performer who steals the film is Gal Gadot as Wonder Woman (it's not a spoiler, she's in all of the advertising). 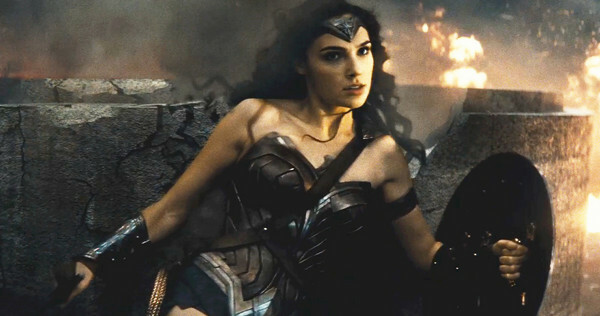 Yes, the character is decidedly underdeveloped and mostly a tease for future films, but Gadot brings a wonderful energy to the role, and is appropriately exotic for an Amazon Princess. Her appearance in her full superhero glory is one of the highlights. Seriously, how has it possibly taken this long to get the character onto the big screen? The other MVP of the movie is actually Laurence Fishburne's Perry White, who showed potential in the first film and really delivers it here, with all of the best comedic dialogue. The interplay between White and Kent was so much fun it made us wish there was a TV series that allowed us to spend more time at the Daily Planet. Jeremy Irons is also a welcome presence as Bruce Wayne's butler Alfred, playing a version somewhere between Michael Gough's austere servant and Michael Caine's concerned father figure. The most most divisive character may turn out to be Jesse Eisnberg's Lex Luthor, and it's certainly the one which left us the most ambivalent. Eisenberg seems to be trying to achieve the seriousness of Heath Ledger's Joker while playing it as over the top as Jim Carrey in Batman Forever. 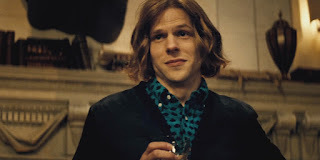 And while we have no qualms about the film departing from the version of Lex Luthor found in modern comics (a very different incarnation of the character from the Gene Hackman version we grew up on, or the bald mad scientist from the cartoons of our youth), the backstory/motivation he's given here is incredibly dark, even disturbing, and since it's given only as a throwaway reference to explain a fairly one dimensional character, it's in very bad taste as it relates to a rather serious real world horror. 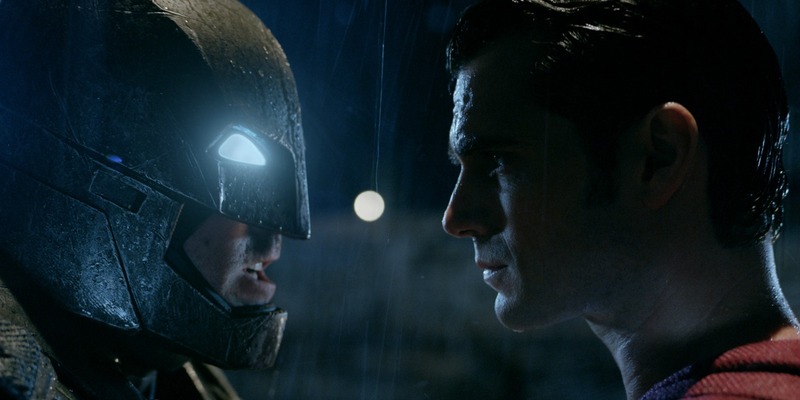 Ultimately, Batman v. Superman: Dawn of Justice left us with very mixed feelings, and most of that comes from trying to bite off and chew so much in one movie. Whereas The Avengers played like a culmination of a well-crafted setup, this plays like they decided to shift gears after Man of Steel and decided to bring back Batman and launch a shared universe as quickly as they could. It's often messy and never quite fully realizes any of its ideas, and it certainly did not need to be 2 and a half hours long (perhaps, like Snyder's heavily divisive take on Watchmen, this will play better when viewed in chapters.). But when it works, this is exciting comic book fare that gives us a teaming of the World's Finest many of us have waited all our lives to see. 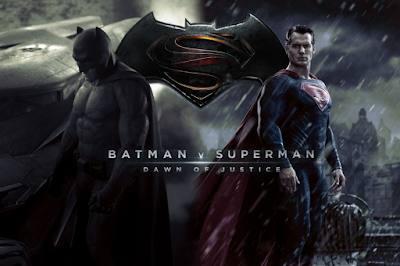 It's a must see for DC superhero fans, and delivers enough genuine thrills to be worth the price of admission. Here's hoping that in the future DC and Warner Bros. manage to fully crystallize the vision of what they're trying to to do the way Marvel has at it's best, and these heroes get a movie as truly super as its title characters.